The growth of the information communication technologies (ICTs) has fostered the adoption of e-government across the globe. E-government offers many benefits to developing countries. However, these countries are often plagued with problems that inhibit the implementation of e-government initiatives. As a result, research in e-government has attempted to offer solutions by listing the factors that influence the success and failures of e-government initiatives. The argument is made here, however, that by failing to consider the internal complexities unique to developing countries, these factors only offer palliative solutions to problem. Furthermore, these factors overlook the role that organizational culture plays in influencing the success or failure of e-government initiatives. Following existing literature in e-government, this research will highlight some the major factors listed for e-government successes and failures in developing countries. It will also show how influential organizational culture is in understanding the organizational changes proposed by e-government programs as well as how it has been overlooked in much of the existing literature. The growth of ICTs has had a significant impact on the function of governments. ICTs are technologies such as the internet, intranet, extranets and other such technologies that “cover the spectrum from basic infrastructure implementation to technologies that improve services and operations in an organization” (Gupta, Dasgupta and Gupta, 2008, p. 140). The use of ICTs in government is referred to as e-government. The governmental use of ICTs is on the rise across the world with 19% of all governments offering online services (Ibid.). Gupta et al. (2008) state that e-government is defined as the use of technology to enhance the access and delivery of services to benefit citizens, employees and business partners. 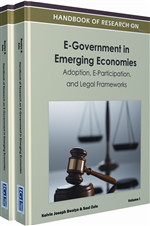 Literature in e-government often borrows or builds upon the definition offered by the World Bank (Dada, 2006; Falabi, 2007; Kaaya, 2004). The World Bank defines e-government as the use of ICTs by government agencies, such as the internet, wide area networks, and mobile computing, “to transform relations with citizens, business and other arms of government” (World Bank, n.d.). E-government thus moves beyond putting services online. It focuses on harnessing information technology with the attempt to remain relevant in an era that is more interactive and informative. It also involves the ability to use technology to achieve levels of improvement in various areas of government thus transforming the nature of politics and the relations between citizens and government (Dada, 2006). The interaction between government and its stakeholders is classified in the following ways: government to business, government to internal employees, government to other institutional government organizations and lastly government to citizen. ICTs work for the benefit of stakeholders by improving the efficiency and access to government (Gupta et al., 2008). Organizational Culture: The cultural manifestations (values, beliefs, assumptions, perceptions, behavioral norms, artifacts, and patterns of behavior) that give meaning to the behavior of people within an organization. Organizational learning: A continuous process in which the organization learns and adapts through systematic integration of new knowledge. E-Government: The use of ICTs by government agencies (such as the internet, wide area networks, and mobile computing) to transform relations with citizens, business and other arms of government. E-Government Success/Failure: The ability or inability to reach the goals set up by e-government. E-Government Initiatives: Goals set up by governments and to be accomplished through the use of ICTs (often targeted towards development). Developing Countries: Countries that have not achieved a significant degree of industrialization relative to their population; often with low to middle standard of living. Organizational Change: The transformation of the organization, whether positive or negative.